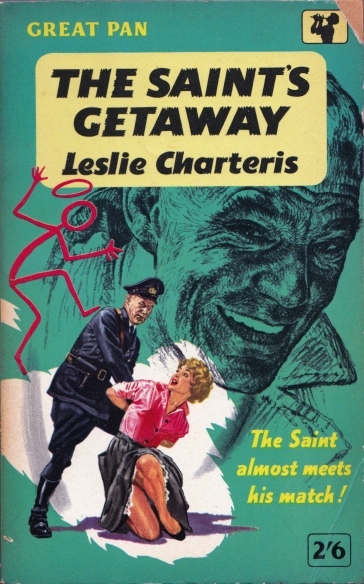 The Saint's Getaway was originally published in 1932 as Getaway, although two earlier versions of the story appeared in Thriller magazine earlier that year. Simon Templar, his beloved Patricia Holm and his pal Monty Hayward are enjoying a well-earned holiday in Innsbruck. They are lying low, or at least are supposed to be lying low, after their previous adventure (recounted in The Saint vs Scotland Yard AKA The Holy Terror). Simon has promised Patricia that he won’t get himself into any trouble. Sadly that promise doesn’t last long. But what can a chap do when he sees a scrawny little runt of a fellow being beaten up by three thugs? Simon naturally intervenes. It turns out that the situation is not at all as it appeared to be and Simon has stumbled into a major and very dangerous conspiracy. Which of course absolutely delights him. He’s up against a fine villain too - the smooth but sinister Prince Rudolf. There are jewels involved. Extremely valuable jewels. Their value might well be more than merely monetary. The jewels have been stolen of course, but not necessarily for the usual reasons that jewels get stolen. The police are anxious to recover the jewels. Prince Rudolf is very keen to have the jewels in his possession but he does not wish to become involved with the police. The question of the ownership of the gems might prove slightly troublesome. Since he was known to have the jewels on his person both the police and Prince Rudolf’s crew are now hot on the Saint’s trail and it is by no means certain that there are not other interested parties as well. The pursuit is so relentless that Simon could be forgiven for focusing on escape for himself and his companions but in fact he is making grandiose plans involving those very valuable pieces of rock. This is still the early Saint, the devil-may-care adventurer possessed of insane levels of self-confidence and optimism. The more the odds seem stacked against him the more he enjoys himself. His childish but exuberant sense of humour is very much in evidence. Whether the reader appreciates this sense of humour is a matter of taste. I like it and given Charteris’s immense commercial success it’s safe to say that most readers at the time did as well. Charteris’s style is, as it was in all his early work, outrageously over-the-top. Like just about every fictional crime-fighter Simon Templar is of course a master of disguise. This is a feature that almost entirely disappears from popular fiction in the postwar period but back in 1932 it was more or less obligatory. The Saint’s ability to speak fluent German also comes in handy. Mostly though Templar relies on sheer bravado and bluff and a tendency to do things that are completely crazy but totally unexpected. These are qualities that other fictional heroes also possessed but none took them to quite such extremes as the Saint. It also needs to be pointed out that the early Saint still had a very flexible approach to the law. He did after all start his career as a criminal. He is now very much on the side of the angels but a man is still entitled to make a living. The Saint would never even consider stealing from decent law-abiding folk but he tends to regard stealing from criminals (the ungodly as he calls them) in a much more favourable light. He considers himself to be basically an honest man but there are irritating individuals in the police forces of several countries who take a different view and some of them are so unreasonable as to to wish to put the Saint behind bars. Which of course as far as the Saint is concerned just adds a bit more fun to life. 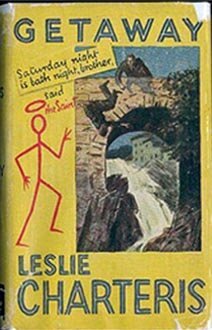 Leslie Charteris was especially enamoured of the short story and novella formats but he demonstrates here that he was equally adept at writing novels. He keeps events moving at a blistering pace and he spins a pleasingly intricate plot. There’s as much action as any reasonable person could want. The Saint's Getaway is a rollicking roller-coaster ride to adventure. Highly recommended.